Sib Font Editor 2.24 | Free eBooks Download - EBOOKEE! What is required to create a good bitmap font? Maybe some desire and time? Yes, but even the most gifted craftsman fails to impress without proper tools. If you want to make fonts, then take a look at Sib Font Editor. It has everything needed to make quality bitmap fonts with ease. Designing bitmap fonts is a very creative and exciting process. Typographers and graphic designers earn a living by creating fonts, regular users do it as an interesting way to express themselves. Both professionals and beginners need the software that will allow them to start off right away with high efficiency and reach impressive results. Sib Font Editor meets these requirements. It contains all the features necessary to create fully-fledged bitmap fonts. Sib Font Editor supports .fnt and .fon bitmap fonts. It can save a font of one type to another and also can add a font to one more .fon file. With the help of export and import features, you can insert bitmap images as symbols and save a given symbol into a bitmap file. 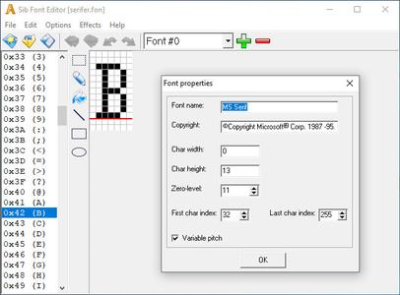 The tool can quickly change font properties, including name, copyright, symbol width, height, zero level, index of the first and the last symbol. You can also view the font's header at any time. The creators of Sib Font Editor put a special emphasis on providing users with a comfortable working experience. The software comes with a set of drawing tools that will considerably enhance your design abilities. If a symbol includes some geometric figures, you can swiftly add them to complete a symbol. Copy and paste operations along with Undo and Redo functions add more comfort. The flip effect allows mirroring a symbol both vertically and horizontally. All the features are carried out with simple mouse controls, so making a font is a piece of cake! Sib Font Editor will benefit both professionals and beginners. With this software, you will easily and quickly put your ideas into practice. It is designed to let your imagination develop freely while you make fonts. You'll be able to create most sophisticated bitmap fonts smoothly and easily. Enjoy the intuitive controls, a variety of features and be productive! No comments for "Sib Font Editor 2.24".